Powerful figures from the late Iron Age through to the end of the Vikings were drawn to a sandy plain on South Uist, according to archaeologists. Bornais, on the west side of the island, has the remains of a large farmstead and a major Norse settlement. The area has produced large numbers of finds, including what have been described as exotic items from abroad. Green marble from Greece, ivory from Greenland and bronze pins from Ireland have been among the finds. 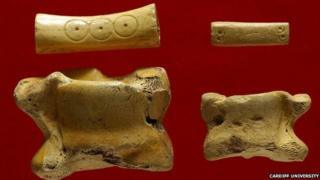 A piece of bone marked with an ogham inscription, an ancient text that arrived in Scotland from Ireland, was also found. Archaeologists said the items provided a detailed picture of life in the first millennium AD. The universities of Cardiff and Sheffield have been involved in a long-term project to record South Uist's history, from the initial prehistoric colonisation through to the Clearances of the 17th and 18th centuries. A complex of mounds on the wide sweep of machair at Bornais was excavated between 1994 and 2004. What was uncovered is now being explained in a series of books. The latest published by Oxbow Books for Cardiff University details the late Iron Age history of Bornais. A later volume will explore the area's Viking past. Prof Niall Sharples, head of archaeology and conservation at Cardiff, said Bornais had provided the island's best record of settlement activity from the 5th and 6th centuries to the 13th and 14th centuries. He edited the new book, A Late Iron Age farmstead in the Outer Hebrides: Excavations at Mound 1, Bornais, South Uist. Prof Sharples said the large sizes of the area's settlements, and the quality of the finds recovered, suggested that people of significance had lived there. He said: "From the late Iron Age there are the remains of what is called a wheelhouse. "This is not uncommon, but what is interesting is the house burned down and a new home was built over the top of the collapsed roof, preserving the carbonised roof timbers and items on the floor beneath it." The relics from this house included a decorated animal bone called an astragalus and a bone dice which had been pushed into the floor of the rebuilt house. Prof Sharples said: "These bones are thought to have been used in gaming and the dice is marked with numbers one, four, six and three. "But they may also have been used in trying to predict the future. "After the fire, they may have been used to help the occupiers to decide whether the fire was a bad omen, or if the house's future was safe." Cattle bones found decorating the hearth in the rebuilt house may suggest the residents later went on to host a large feast to celebrate the rebuilding. Prof Sharples said: "Between seven and 12 cattle would have been needed to provide the foot bones used, suggesting whoever occupied the house could afford to lose that number of livestock." The Vikings later occupied Bornais, on a site a little distance away from where the Iron Age dwellers had lived in the 5th and 6th centuries. Clues that a Norse of high status lived in the later settlement include a piece of green marble thought to have been quarried on a Greek island. The same marble was used as building stone in Rome. Prof Sharples said the fragment from Bornais was shaped as a slab and possibly brought as a Christian relic from Rome. He added: "Bornais is the largest Viking settlement known in Scotland, certainly outside of the towns, and someone very important in the hierarchy of the Kingdom of Man and Isles is likely to have lived here."